Fire rages at the FlowChem Technologies facility in Duson, LA., which forced an evacuation of residents and businesses within a one mile radius. An evacuation order lifted a day after a fire broke out Thursday at the FlowChem Technologies facility in Duson, LA. Residents and businesses one mile north of the plant ended up ordered to evacuate as there was a fire and explosion at the facility. In addition to the evacuation order, those within three miles north of the plant were told to shelter in place, officials said. Massive plumes of smoke billowed from the FlowChem Technologies plant after the fire broke out at 3:30 p.m. on Thursday. There were no injuries in the blaze and investigators are trying to determine the cause of the fire. Xylene, which is used as a solvent in the printing, rubber, paint and leather industries, was among the chemicals that contributed to the fire at the plant, officials said. In addition, there were reports of multiple explosions in the incident. 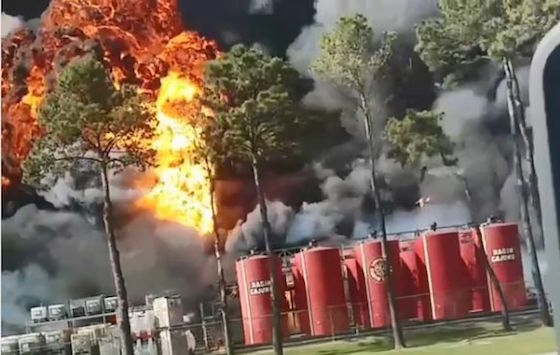 FlowChem officials said the origin of the fire and explosion is still unknown but the company’s facilities on Cutlass Loop received significant damage. They also report there are no uncontained spills, and the Louisiana Department of Environmental Quality (DEQ) confirmed all air-monitoring reflected normal air quality. Flowchem will remain closed while clean-up continues and Louisiana State Police conduct a full investigation.